When it comes to graduation, nothing is more important than making sure your graduates are proud of their achievements, and that they are honored for all they have accomplished. At Honors Graduation, we know that every homeschooling graduation ceremony is unique, and strongly reflects the values of the students, parents, and educators involved. For those homeschoolers who wish to include some traditional aspects at their celebration, or for homeschooling groups who have chosen to share a graduation ceremony, we provide affordable, high quality honor cords. Your students can still receive traditional awards and honors through their nontraditional education, and they deserve to be recognized and rewarded for their efforts. Our homeschool graduation cords come in a wide assortment of colors and pairing options. Whether you choose to offer your students single cords or double tied cords, braided colors or solid, they will appreciate the efforts you have put into their education and in encouraging their future success. We offer cords representative of several prestigious greek letter organizations and honor societies, like the Science National Honor Society, so whatever your homeschool graduates have achieved, you are sure to find a graduation cord to honor them for it. 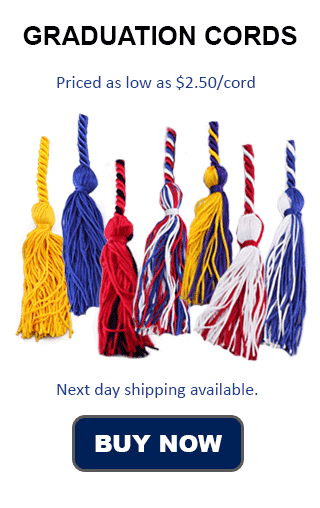 Red, royal blue, and gold are by far our most popular cord colors among public and private institutions and societies, so keep them in mind for those homeschool students who wish to experience a more traditional commencement ceremony. For homeschoolers with more unique interests and achievements, we recommend your try our purple, teal, lavender, and burnt orange cords. These more modern colors will reflect the individualized education that can be received from homeschooling, and can be used to honor your students for achievements that may not have been recognized in a different educational system. You may also consider pairing these colors with some more traditional shades, like white, silver, black, or gold. The possibilities are endless when it comes to acknowledging your graduates' achievements at your homeschool graduation ceremony.